I grew up with my grandfather's stories from his "bottomless hunting stories bag" and every night my mind had filled with magical, powerful life examples scattered with wisdom quotes. In the "Land of Dragons" grass were grey-red and sulfur odored, even the trees were red :-). In the Good Kingdom, everything was green; the sun was shining and birds chirping. Always Princes fought against Dragons and ... always saved Princesses. The Dragons are found in many myths and legends: Chinese dragons bring good luck, in Persian, Greeks, Romanian and Celtic cultures is an incarnation of evil, and in modern times they are seen like primary forces of Nature and the Universe. 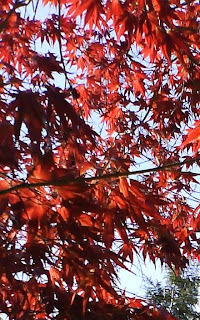 I’ve always been intrigued by the Red Trees and Red Dragons with theirs magical and supernatural powers. Now I have my own Red Dragon Tree that combines those two different concepts from childhood. 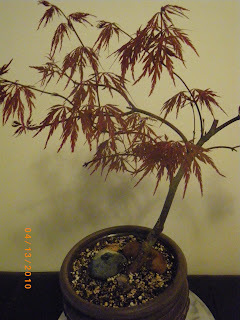 My Japanese "Acer palmatum dissectum Red Dragon" is a lace leaf weeping and has arching branches clothed with large, deeply and finely cut garnet-red leaves. I am sure it will not kidnap any Princess like in my childhood tales and will bring me good luck.